DISCOMFORT: After the tooth/teeth have had the decay removed and structure stabilized, you may experience some minor sensitivity. You can help reduce this by taking aspirin or ibuprofen every four hours. Please remember, if you have been given anesthetic, it should wear off in a couple of hours. Please be careful not to chew on the tooth (teeth) until this occurs. TEMPORARY CARE: A temporary tooth-colored restoration was placed to protect the tooth (teeth) while your new restoration is being made. Avoid heavy chewing and sticky foods. If the restoration seems to loosen, do not be alarmed. Call our office and we will arrange a time so things may be placed in their proper positions. Even if there is no discomfort involved, it is very important that we re-cement this restoration; so that the teeth don’t drift – making placement of your final restoration very difficult. CLEANING: Proper care of the interim restoration – if placed – is a must! Brushing can be accomplished with a gentle motion on the sides of the tooth – flexing the soft bristles at the gum line. We may instruct you not to use dental floss, depending on the procedure. When flossing is recommended, place it gently between the teeth, clean the gum areas as usual, then release your inside finger and pull the floss through the space, toward the cheek. Do not draw the floss back between the two teeth. You are on your way to receiving the most advanced, state-of-the-art cosmetic and structurally sound restorative dentistry available today and are pleased that you are as committed to high quality dentistry, as we are. It’s our privilege to provide you this service. Please call if you have any questions. • If the restoration seems to loosen or is dislodged, do not be alarmed. Call our office and we will arrange a time so things may be placed in their proper positions. Even if there is no discomfort involved, it is very important that we re-cement this restoration; so that the teeth don’t drift – making placement of your final restoration very difficult. DISCOMFORT: After the tooth/teeth have been reshaped, you may experience some minor sensitivity. Aspirin or Ibuprofen usually works very well. Your gums may be irritated. If necessary rinse with Peroxyl which is available at your pharmacy, or a half/half mix of hydrogen peroxide and water; three times per day. This is an excellent method for soothing sore gums. We may recommend gentle finger massage, as well! The jaw joints may be sensitive, as well. This can easily be soothed with the application of warm compresses on the jaw joint. We suggest a heating pad that is designed to be moistened. Place the moist heat on the jaw joint areas – open and close the mouth slightly during this application. The heat should be applied at 10 – 15 minute intervals with 15 minutes of rest between placement. MEDICATION: We may prescribe medication to control discomfort. Please use only as directed. If this medication does not seem to work for you, do not increase the dosage; or mix with other pain medications. Call us! Medications work differently on each individual. It is common to change medications; and a new formulation may work very well. If the discomfort is prolonged; there is swelling, excessive bleeding or fever – again call us. CLEANING: Proper care of your temporary restoration as well as the gum tissue in the area is a must! Brush with a gentle motion on the sides of the tooth – flexing the soft bristles at the gum line of the interim restoration. We would like you to use dental floss. However, place the floss gently between the teeth, clean the gum areas as usual, then release your inside finger and pull the floss through space, toward the cheek. Rinsing with Tooth and Gum Tonic or Listerine will also aid in maintaining healthy gums. You are on your way to receiving the most advanced, state-of-the-art cosmetic and structurally sound dental enhancement available today. We are excited by what Cosmetic Dentistry can do for you and yo and are pleased that you are as committed to high quality dentistry, as we are. It’s our privilege to provide you this service. Please call if you have any questions. DISCOMFORT: After the teeth have been reshaped, you may experience some minor sensitivity. Aspirin or Ibuprofen usually works very well. Your gums may be irritated. If necessary rinse with Peroxyl which is available at your pharmacy, or a half/half mix of hydrogen peroxide and water; three times per day. This is an excellent method for soothing sore gums. The jaw joints may be sensitive, as well. This can easily be soothed with the application of warm compresses on the jaw joint. We suggest a heating pad that is designed to be moistened. Place the moist heat on the jaw joint areas – open and close the mouth slightly during this application. The heat should be applied at 10 – 15 minute intervals with 15 minutes of rest between placement. CLEANING: Proper care of your temporary restoration as well as the gum tissue in the area is a must! If you don’t have healthy gums we cannot bond the permanent veneers which may delay the entire process. Brush with a gentle motion on the sides of the tooth – flexing the soft bristles at the gum line of the interim restoration. Rinsing with Tooth and Gum Tonic or Listerine will also aid in maintaining healthy gums. You cannot floss temporary veneers since, unlike the final restorations, these are all connected as one piece. AFTER DEEP CLEANING: We have now begun the ‘deep cleaning’ therapy sequence. The goal of this therapy is to ‘cleanse’ your oral tissues of bacterial toxins and debris and start the process toward gum and tissue healing. Thus, your gum and supporting structures can be the stable foundation we are seeking; to complete your dental treatment. – Immediately upon dismissal from our office – you may notice slight ‘oozing’ from the gums. This will decrease rapidly. – Over the next few days and weeks, as your teeth and gums become healthier, the gum tissue will actually ‘shrink.’ More tooth may be exposed. Increased sensitivity can occur with these teeth – which is transient in nature. The best way to decrease this sensitivity is to keep the area as clean as possible [brushing, flossing and rinsing; as directed]. • Tooth and Gum Tonic or Prescription rinses to begin 24 – 48 hours after therapy; per your hygiene staff recommendation. You have just received the most advanced, state-of-the-art cosmetic and structurally sound restorative dentistry available today. We are excited by what Cosmetic Dentistry can do for you and your teeth, and are pleased that you are as committed to high quality dentistry, as we are. It’s our privilege to provide you this service. We care about you and want you to be as comfortable as possible so here are a few follow ups. 1. First – SMILE – you now have a bonded restoration that looks great. 2. The cement is already set – and your bonded restoration is ready for immediate use. 8. We recommend professional ‘recare’ evaluations at least twice per year. We then can evaluate the wear of your new bonded restoration; touch-up and polish where needed. • After implant surgery rinse with _ oz. twice a day for two weeks. • It is helpful to sleep with your head elevated on two pillows the first night after the surgery. You may also want to place a towel on your pillowcase, to avoid stains from any slight oozing. • A fever above 101 F.
Office 835-0542. 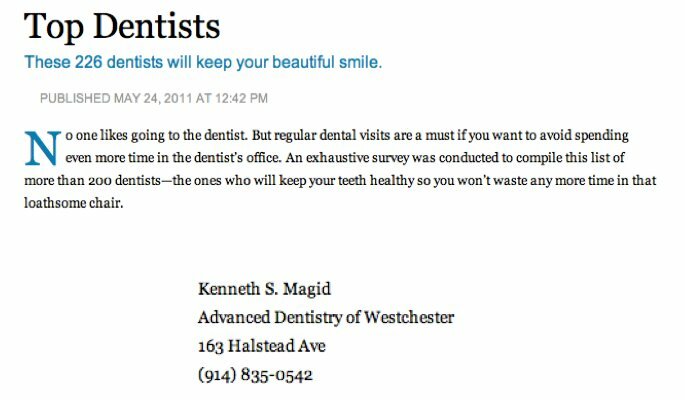 The answering service will contact Dr. Magid, DDS, FICD, if the office is closed or call Dr. Magid’s Cell 715-4110. You’ve received a beautiful – cosmetic – restoration. What Now?? 6. Sensitivity to temperature may result from the extensive treatment of the teeth but it should not linger. If you have any concerns call us so we can check things out, even before any scheduled follow-up visit. 8. Proper care of your new bonded restoration is a must! Brushing and flossing can be accomplished nicely, as normal. There are no special precautions needed. Correct care also includes rinsing. We may have suggested the use of “Tooth and Gum Tonic” or Listerine – a minimum of twice per day. This care will not only prolong the life of the restoration, but will also help to prevent problems elsewhere in the mouth. 9. We recommend professional ‘recare’ evaluations at least twice per year. We then can evaluate the wear of your new bonded restoration; touch-up and polish where needed. E) Avoid smoking for at least 24 hours – and longer, if possible. Do not use chewing tobacco. First of all…SMILE! You now have the whiter teeth you’ve always wanted. c) The susceptibility of your teeth and it’s internal contaminants to the whitening agent. 2) Load the appliance, as demonstrated, by gently depressing the syringe cap – expressing the material only on the front 8-10 teeth – the surfaces that face toward the lip. 6) Wear for a minimum of 2-4 hours/day. This can be accomplished during ‘sleep time’ or during waking hours. The thin tray is very comfortable and can be worn easily while accomplishing other tasks. 7) When the appliance is removed brush teeth and gums thoroughly. The ‘tray’ should be rinsed thoroughly and placed in the appliance case – ready for the next application. Please keep the whitening carriers out of heat and/or direct sunlight at all times. The whitening agent will break down and become ineffective, should this occur. It is best to store the material in a refrigerator. Never attempt to use any household or commercial bleaching agents in your mouth. Only use the teeth whitening agents that we prescribe for you – those that have been tested and approved for intraoral use. Over-the-counter whitening agents normally have a very high acid content – which can dissolve your teeth, permanently ruining your smile. Step 1: Put a ‘dab’ of the paste/gel on the end of a cotton swab, or fingertip, and “smash” on the tooth at the gum line where the sensitivity is occurring. Step 2: “Massage” this paste onto the tooth surface. Keep the product on the same surface for at least 5 – 10 seconds. Step 3: Put another dab of the paste on your regular toothbrush and gently “brush” all your teeth. An additional benefit can be obtained, just before bed, by placing another dab of paste on your teeth in the sensitive areas, “massaging” it in, and leaving it there, as you sleep!